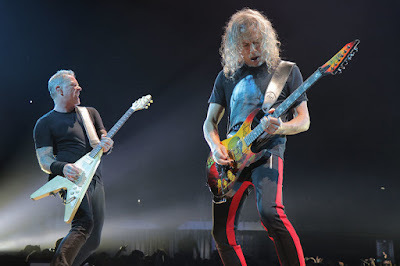 Metallica performed their 1983 classic, “Seek & Destroy”, at the WiZink Center in Madrid, Spain on February 3, and the band are streaming professional footage from the show. The tune appeared on the group’s debut album, “Kill ‘Em All”, which didn’t appear on the US Billboard 200 chart until three years later, where it peaked at No. 66 on its way to eventually selling 3 million copies Stateside. During the spring trek, the group will return Stateside to be on hand when Major League Baseball’s San Francisco Giants host the 6th annual Metallica Night at AT&T Park on April 23. “We'll take a quick break from the European tour to head back to the Bay Area and celebrate one of our favorite hometown traditions,” says Metallica. “Members of the band will be on hand to start things off right with the National Anthem and first pitch, sticking around all night to cheer on the team against the Washington Nationals. As is customary, we'll take part in some of the between-inning fun and games as well as an exclusive pre-game VIP event. “Special Event Metallica ticket packages include a ticket to the game and a limited edition Metallica/Giants baseball cap, with a portion of the proceeds from every Metallica Day Special Event ticket sold benefiting our very own All Within My Hands Foundation. Metallica Fifth Members will have a chance to purchase tickets in a special pre-order on Tuesday, February 6 at 10:00 AM PST; log in to the site at that time for a link to purchase tickets to the game and the VIP event early; the pre-sale ends on Friday, February 9 at 5:00 PM PST. All pre-sale tickets have a $5.00 discount. Ahead of the 6th annual Metallica Night, the metal icons will reissue their 1987 collection, "The $5.98 EP – Garage Days Re-Revisited", on April 13. Out-of-print and available for the first time in decades, the 5-track set sees the band deliver covers of some of their primary influences, including Diamond Head, Misfits and Budgie.